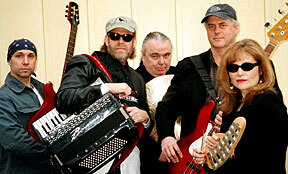 Professor "Louie" and the Crowmatix perform a tasty mix of rhythm and blues, rock'n'roll and their own songs. They have released their third CD "Flyin' High" on The Woodstock Records Label. Hurwitz, who co- produced the last three Band albums, Jericho, High On The Hog and Jubilation, also played keyboards on the latest offerings of Graham Parker, Mercury Rev & Larry Packer. They have shared the same stages with Garth Hudson, Bela Fleck, The Wailers, Graham Parker and Eric Burdon to name a few, and will be performing songs from their new CD as well other favorites. Tagged Professor "Louie" by original member of "The Band" vocalist / bassist Rick Danko. The Crowmatix lineup includes Aaron, a.k.a. Prof. "Louie" (vocals/keyboards/accordion; Gary Burke (drums) who has recorded and performed with Bob Dylan and Joe Jackson; Miss Marie Spinosa (vocals/percussion/keys) who sang with "The Band" on their last two CD's and Mercury Rev's Deserter's Song; Mike DeMicco (guitar) best known for his work with The Brubecks, Rory Block and The Crowmatix.